This tab displays the attendance of the employee for selected dates. This tab is available in organizations that use the attendance clock of Hyper and allows to modify the working hours and dates. 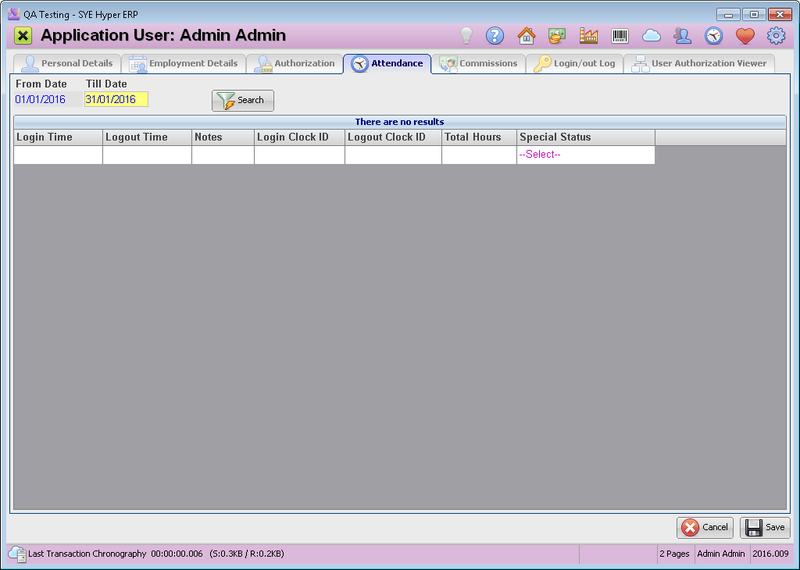 When using the attendance clock or the Magnetic Strip ID (as defined in the authorization tab), the Login time and the Logout time will be added to the presence log in this tab. Login Time The login date and time. Logout Time The logout date and time. Notes Special notes related to this working day. Login Clock ID The login reporter ID. Logout Clock ID The logout reporter ID. Total Hours The total working hours of the selected date. Day off with Salary - The employee took a day off and uses an approved day off with salary. Holiday with Salary - The employee took an approved day off for a holiday, which is paid by the employer. Sick day with Salary - The employee took an approved sick day with salary. Day Off - The employee took a day off and will not get a salary for this day. Holiday - The employee took a day off for a holiday which is not paid by the employer. Sick Day - The employee took a sick day and according to his employment contract will not get paid for it. Bonus Day off (with Salary) - The employer gives a day off with salary, which will not be reduced from the employee's accumulation. Additional information fields can be added to this table according to the management needs and requirements. The dates and hours in this table can be modified according to authorizations.